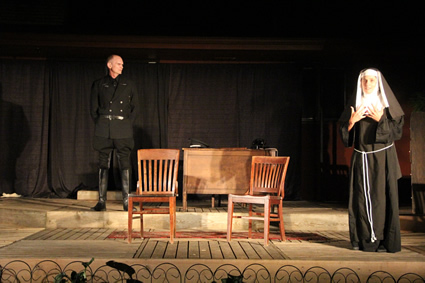 On September 12, 2015, Hero Now Theatre began life with a one-night performance of A Thing of Beauty by Charles Kray. This one-act play, based on real events, concerns a Nazi officer pursuing a Jewish philosopher who converted to Catholicism and entered a convent. If he found her, and she confessed, would he release 19 other nuns on their way to a death camp? What if she didn’t confess outright but in the end changed something in the officer’s heart? Hero Now Theatre invited the people we knew: friends, family, acquaintances from the theatre world—in other words, people who believed in our mission and were excited about our mission. We had 75 in attendance, announced our intention to stage our second production (Terra Nova) in January 2016, and, with some generous contributions from several, ended the night with the encouragement to proceed with plans.